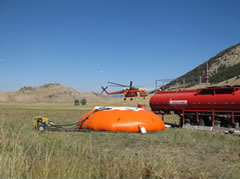 The Hydrostar Onion Tank (also known as a blivet or pumpkin tank) by GEI Works is a low or high sided portable, easy to use, self-rising emergency water storage tank that is ideal for firefighting, emergency, or military needs. 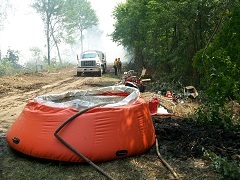 Features of the self-rising Hydrostar Onion Tank are a foam collar, welded seams for extended life, a 2 inch bulkhead valve with a plug that allows for quick draining of the onion tank, and customizable tank wall which can be made from nearly any material, including vinyl, heavy duty PVC, urethane, NSF 61, or many other FDA approved potable water matrials, chemical or fuel resistant fabrics. These self-rising tanks are suitable for extended duration and various climate conditions making the Hydrostar Onion Tank a great choice for quick-use water storage. Onion Tanks collapse for efficient storage and easy transportation, similar to our bladder tanks, they provide collapsible, portable water storage but with a self-rising, quick fill option. When you are ready to use your Hydrostar Onion Tank, it can be set up with just one person, simply unfold the tank, drape the hose over the foam rim and fill with the liquid of your choice. As a result of its self-rising design, the onion tank will fill to its designated standard capacity of 250 to 10,000 gallons in a short period of time. See our Hydrostar Onion Tank Product Flyer or our Onion Tank Installation Instructions for details. For more information, please visit our Hydrostar Onion Tank Specifications and Hydrostar Onion Tank Emergency Response pages. If you have questions about the Hydrostar Onion Tank, feel free to give us a call at 772-646-0597.